A series of executive reports on each product featured in The Advanced Analytics Survey 19. Each report contains a vendor and product overview by BARC’s analyst team plus a summary of the relevant product-related results from The Advanced Analytics Survey 19. There are ten Vendor Performance Summary reports, one per product. They are all available to subscribers as part of the BARC Access package. 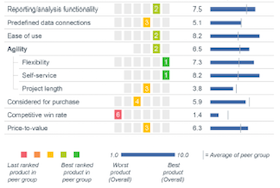 The Advanced Analytics Survey 19 attracted a total of 677 responses, enough to analyze customer feedback on 10 products from 8 vendors in detail. There’s no better way of discovering a vendor’s strengths and weaknesses than finding out how its customers rate its product. Each Vendor Performance Summary gives an overview of the product’s results in The Advanced Analytics Survey 19 accompanied by conclusions written by our experienced analyst team.